Step 1 Preheat the oven to 350°F. In a large bowl, combine the flour, baking powder, sugar and butter and rub together to make fine crumbs. Make a well in the centre of the mix and add the egg and 1/2 cup of milk. Bring the mix together with a metal spoon, making sure you don't overmix and toughen the dough. 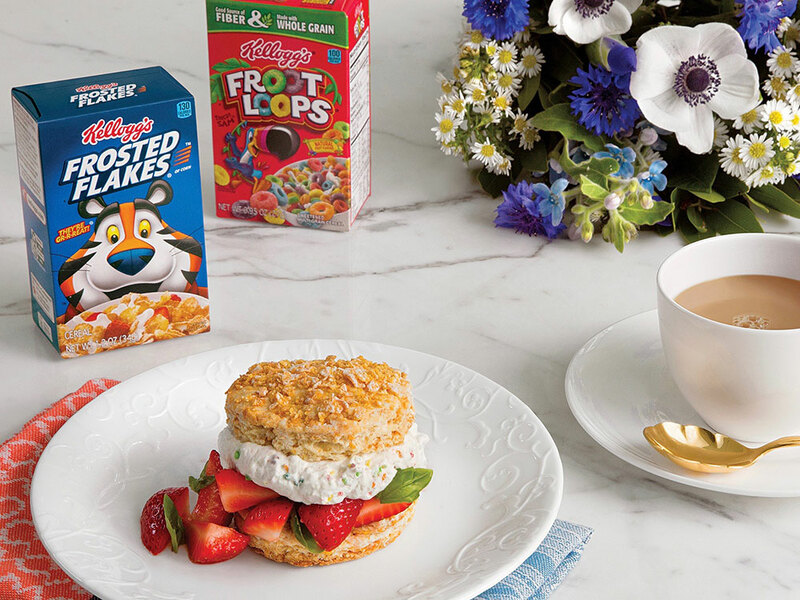 Add more milk if needed and then add Kellogg's Frosted Flakes and fold them into the dough. Step 2 Flatten the dough into a one-inch thick piece and cut out rounds or squares using a cookie cutter. Put the scones onto an ungreased baking sheet and bake for about 12-15 minutes, until they're golden brown on top, then place them on a wire cooling rack. Step 3 Slice the strawberries into a small bowl, add the sugar and chopped basil, and stir to combine. In a food processor, blend the Froot Loops until they form a powder. In a separate bowl, whip the cream with an electric mixer until stiff peaks form, about a minute, and fold in the Froot Loops powder. Slice the scones in half and sandwich the strawberries and whipped cream in the centre. In the mood for a royal recipe? Then you’ll love these scones with macerated strawberries, created by Chef Darren McGrady, former personal chef to Queen Elizabeth II.